Anniversaries are one of those special events that inevitably occur in every person’s life. Whether it is to celebrate the beginning of a new milestone in life like a wedding, a foundation of a company or organization or a commemoration of an important part of history, each one of us has to celebrate an anniversary more than once in our lifetime. Even the start of a romantic relationship or friendship is celebrated once a year, nowadays. Therefore, no one has an excuse not to dedicate a single day to remember special moments you have shared with the important people in your life. There are many ways to celebrate anniversaries. It ranges from simply greeting people to putting up an elaborate festival where a whole nation can revere together. Other things that you can do is to give out greeting cards to the special people you are celebrating the occasion with or inviting people to an exclusive party that you’re organizing. Whichever of these things you have in mind, we provide you with some essential tools that you certainly need below. Here is a collection of different anniversary cards for various purposes that you can download and use, or find inspiration from to make your special day even extra special. So, what are you waiting for? Dig in and enjoy choosing from this extensive list of anniversary greeting cards, invitation cards, and more! To start with, here is a vintage invitation card for an anniversary celebration. 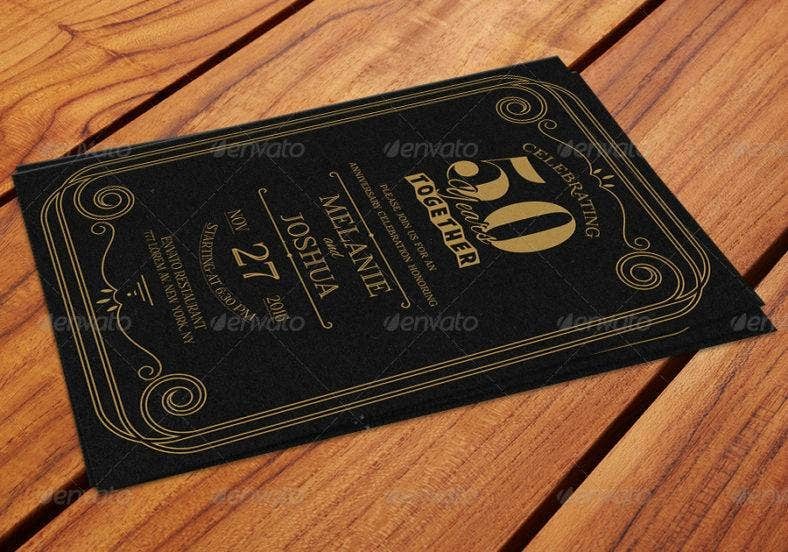 If you’re planning for a rustic or retro-themed party for your company or organization, then, this is the perfect event invitation template for you. With its elegant design, you can also use this for any formal occasions such as a fancy dinner party with family or a night gala. 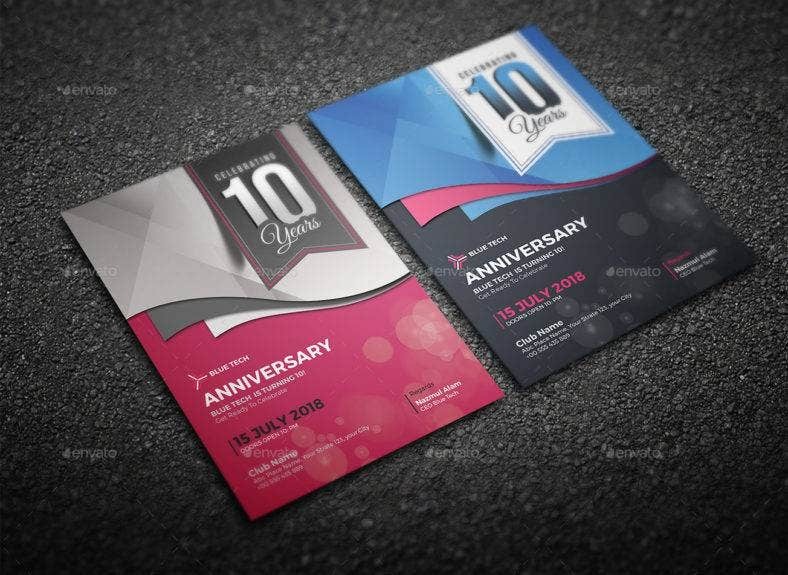 This is a fully layered PSD anniversary invitation card template in 300dpi and uses CMYK color model. Furthermore, all the images used are in vector format so, they are completely editable and easy to customize as well as the text, font, and color are needed. Once you’re done with the changes, your file is ready to print. 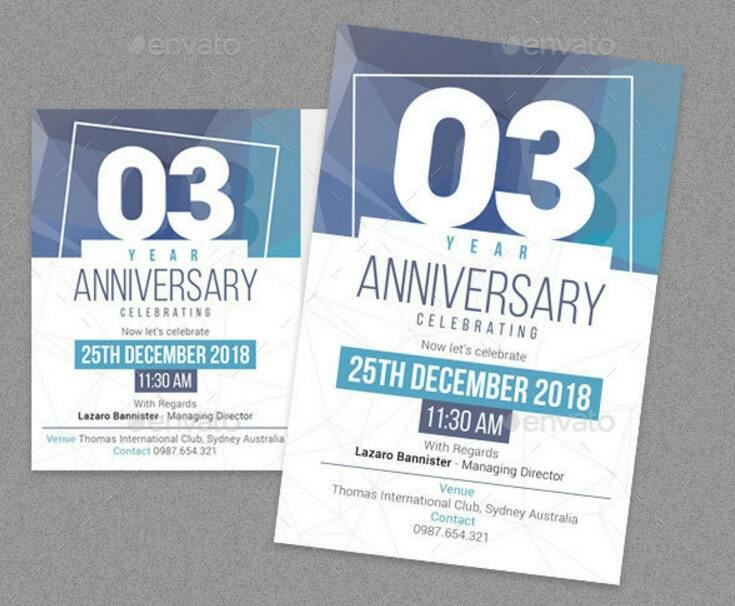 Speaking of companies, here is another invitation card template designed exclusively to use for your company anniversaries. As you can see from the preview above, this card template is characterized by classy and sophisticated elements such as fonts and creative backgrounds to exude both professionalism and fun at the same time. This template comes in two color versions to choose from, with well-organized PSD files where layers are named and placed in folders in case you want to edit some images, colors, or texts. These files are also optimized with resizable vector shapes, free fonts, 300 dpi resolution, CMYK color model, and more. 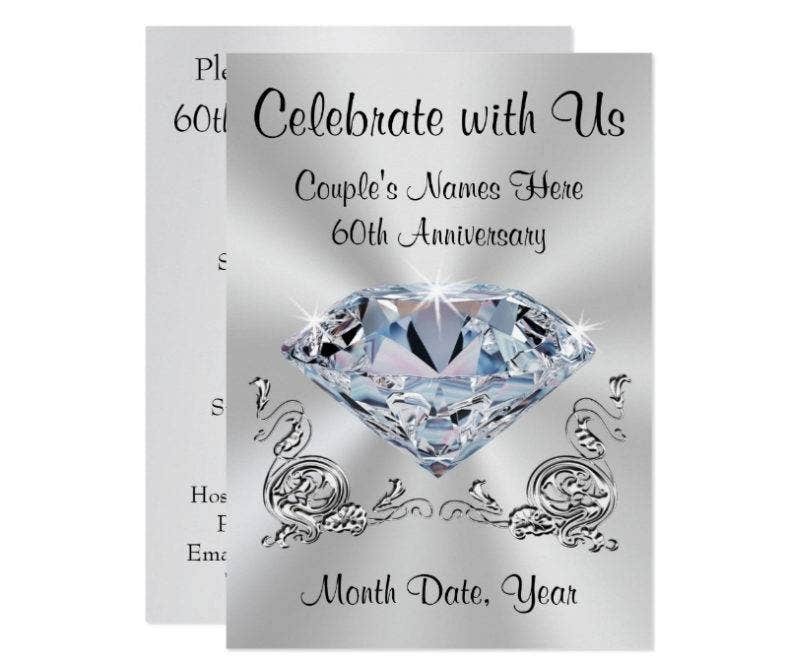 In case you’re looking for a wedding anniversary invitation card for a couple who are lucky enough to live through 60 years together before death tears them apart, the personalized diamond anniversary invitation card you see above is all you need. Whether it’s for your grandparents or yourself, anyone will surely love this template. It is simple yet elegant at the same time, with a minimal but classic approach to its overall design. Downloading this template, you are allowed to customize the card by choosing from 8 additional sizes and 6 shape styles with 2 printing options available. It can be printed in a high-quality, full-colored, 5 x 7 inches default size. This time, we have a gorgeous wedding anniversary greeting card that you can use to greet your loved one on your special day. Decorated with a dazzling typography art that says “Always & Forever”, it is a great way to reminisce and reiterate the vows you made when you started your new life together as husband and wife. 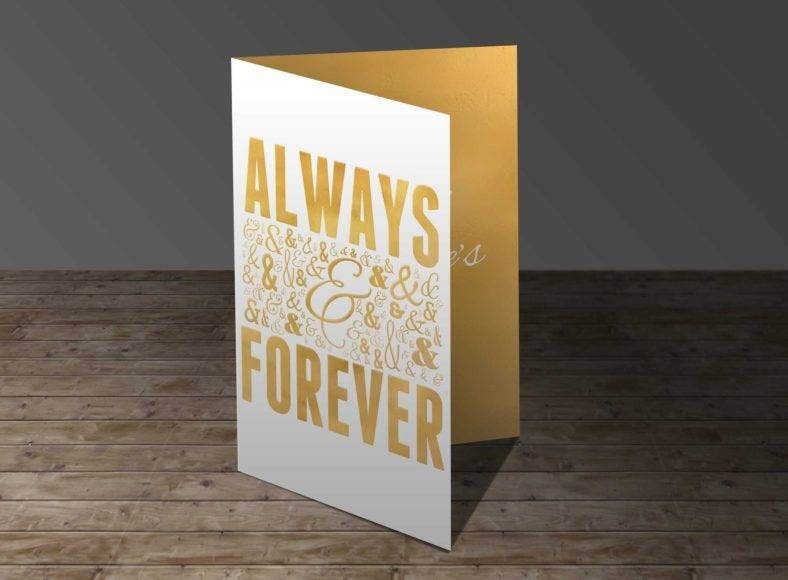 A gold-foil greeting card that is also perfect on Valentine’s Day or any romantic occasion, it comes with an InDesign file that allows you to customize the interior message and a print-ready bleed, a PDF file, a text file with a download to the free font used, and all the images you need for printing. Next is another wedding anniversary invitation design that boasts of a classic style that can also be used for many other occasions. Made with shape layers, you can customize the content easily and resize the design to whatever size you want without compromising its quality. It also comes with 4 different PSD files for every major wedding anniversary celebration. The card’s default size is 4 x 6 inches with a bleed area of 0.25 inches. It has a 300dpi resolution and CMYK color representation. The fonts used in the design are free fonts that you can download, namely “Pistilli”, “Cinerama”, “Foglihten”, and “Alex Brush”. 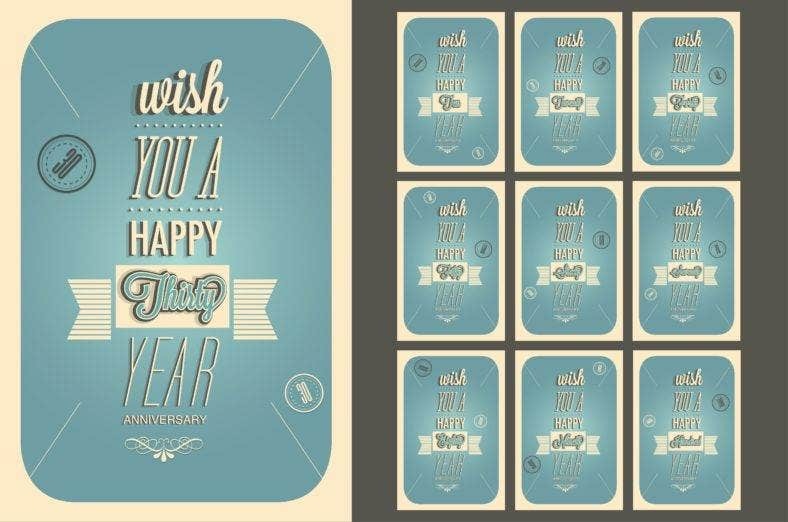 This is a creative and classic card template that you shouldn’t miss. What you see above is a crafty surprise party card for a couple’s 50th wedding anniversary. It is decorated with an elegant rose gold glitter confetti theme with modern typography and dark background to highlight the content of the card more. This makes any invitation or announcement of every special occasion extra fun. Moreover, this flat card lets you modify the background color to match your event’s theme, and also allows you to customize its content by adding photos and text to suit your needs. you can also choose from 8 additional sizes and 6 shape styles in order to create the perfect anniversary card that is according to your preference. Anniversaries are not just for weddings. Here, we celebrate the founding of an organization by giving out anniversary postcards whether as an invitation, announcement or greetings. This anniversary post card and invitation card template has a clean, yet an interesting design that is not overwhelming. Yet, it still catches attention. The template comes in a 4 x 6 inches size that is fully editable, and has a fully layered double-sided design created with PSD so, it is easy to use. It uses the CMYK color mode with 300 dpi resolution and 0.25 inches bleed. It also has customizable text layers and smart object layers, giving you enough freedom to decide on the content. Here is an example of beautiful Save the Date templates for your silver wedding anniversaries. As a common concept for weddings, having a floral motif is guaranteed to work for such romantic occasions. And what can be more perfect than a gorgeous and classic wedding anniversary party card filled with pink roses and pink bows? The design comes with a CMYK color mode with 300 dpi resolution in 6.25 x4.25 inches size with 0.25 inches bleed on each side. The template package includes a PSD file with well-organized layers which consists of editable text layers and smart object layers for easy customization. It also features one color free font and a help file to add. Next is this collection of anniversary coupon cards which is probably the most perfect gift idea for couples, whether official or not, meaning, married or in a relationship. Each card on the collection presents a predefined lovely customizable theme of pre-planned date nights for every month for the whole year. 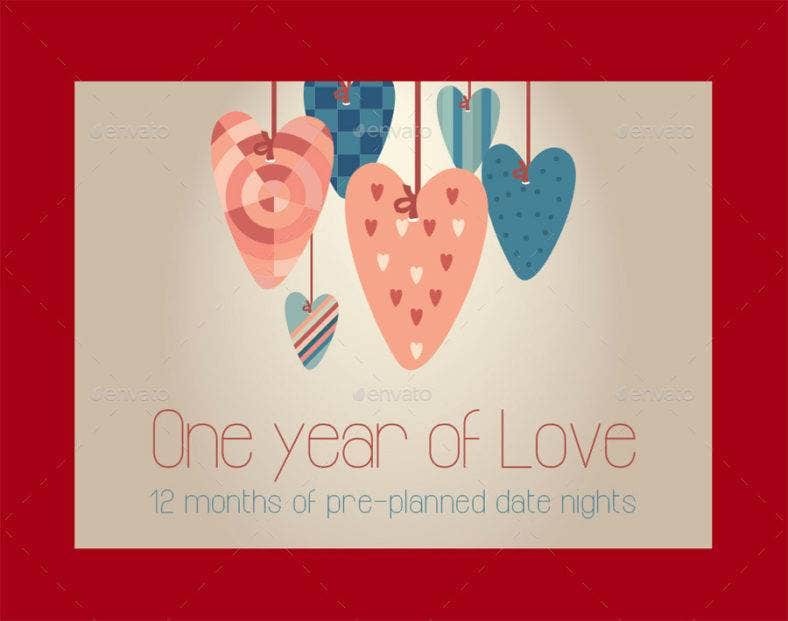 This 13 page anniversary gift coupon cards are composed of vectorgraphic elements and customizable texts, so you can change the nature of the dates and activities pre-written on the cards to suit your personality or preference as a couple. It comes in two sizes and two formats, and allows you to use both size as card stakes or bounded with a cord. 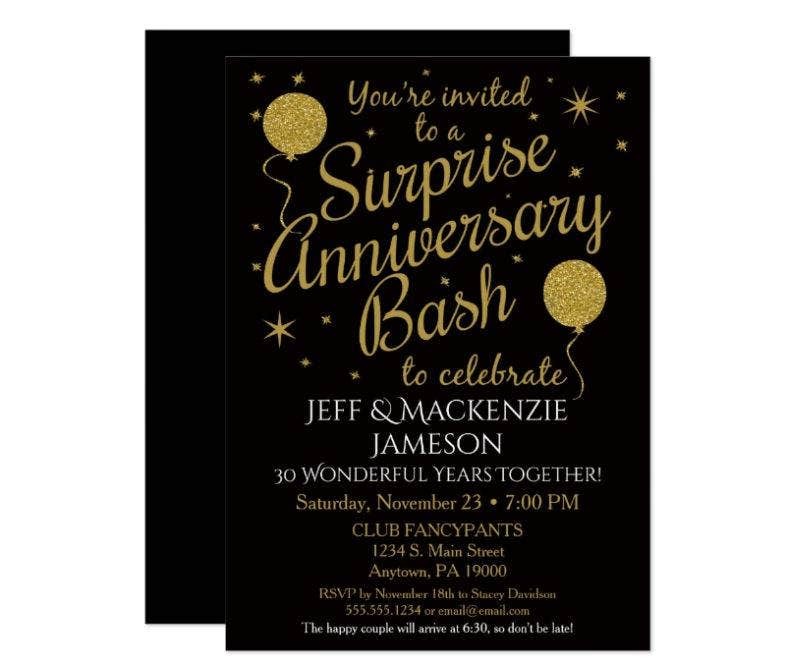 Another surprise anniversary party invitation card with a fabulous black and gold design perfect for any type of anniversary bashes. The fun and festive mood of the card design is accentuated with the faux gold glitter balloons and stars over a black background. These features give it a whimsical flair and stylish edge that people will surely love. It comes with a size of 5 x 7 inches with 8 extra size and 6 shape styles for more layout options, a high-quality, full-color, and full-bleed printing on both sides with two printing options available, customizable content which lets you add photos and text to both sides, and so much more. The glitter details, however, are simulated in the artwork. 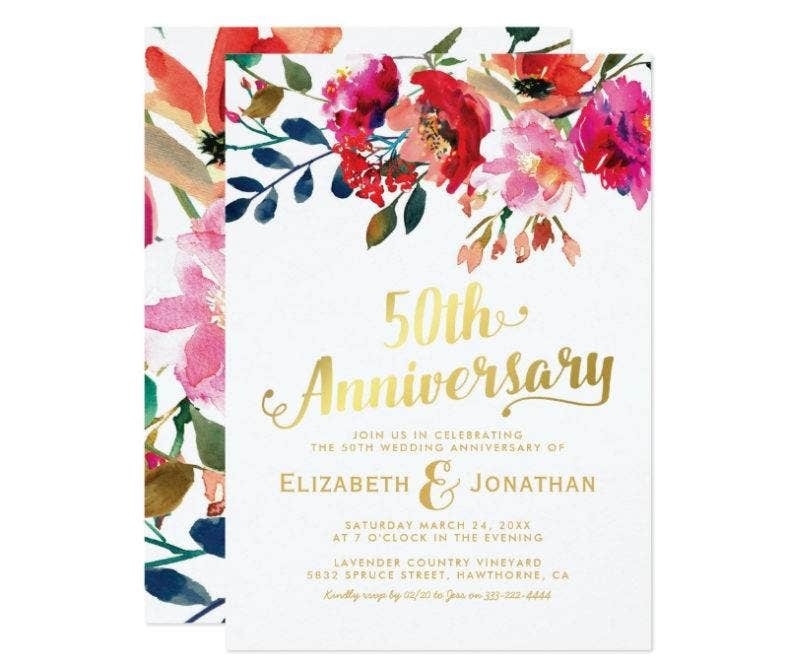 Featuring a classic white background, watercolor floral display, and a stylish faux gold foil typographic title, this modern anniversary party invitation template is a personal favorite from this list because of its modern and attractive design. Although there is no actual foil used in rendering the design, the simulated artwork still works with the overall theme. Additionally, on the item’s page, you can modify all the text styles, colors, and sizes for further personalization making sure the product suits your needs. 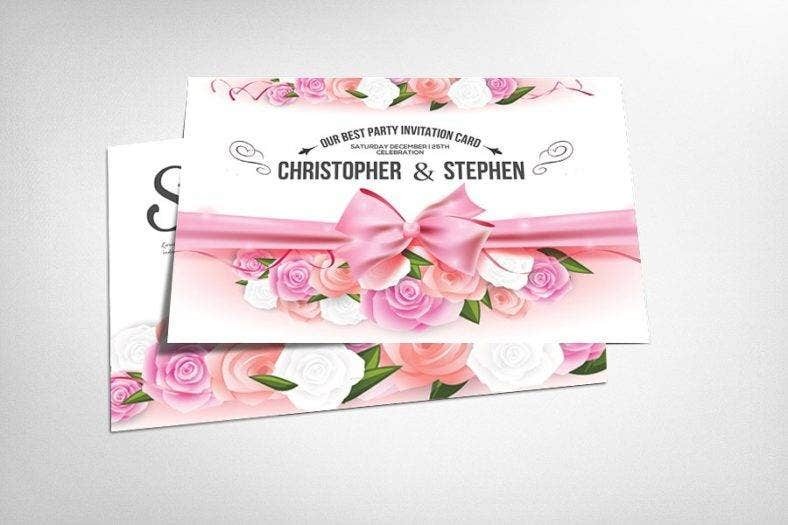 You can also make custom invitations and announcements for every special occasion using this theme, such as weddings, birthdays, baby showers, and much more. 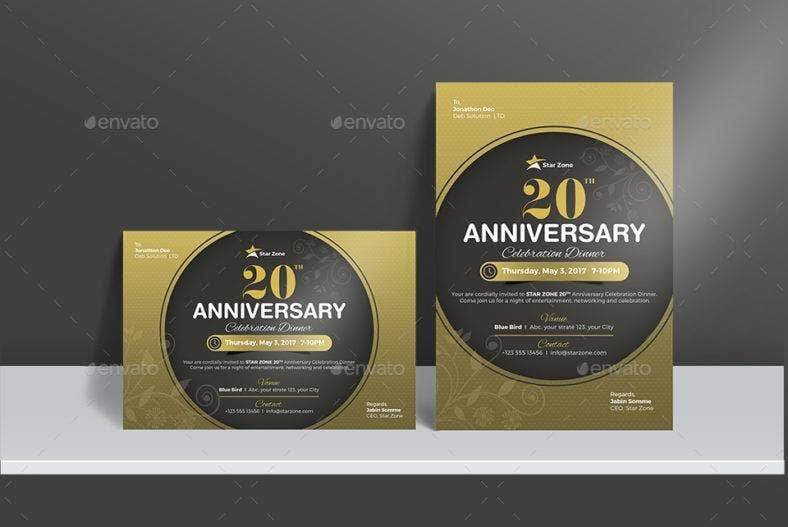 An elegant anniversary invitation card that can be used for many multiple purposes, this template can be utilized for corporate and company anniversaries, wedding anniversaries, anniversary parties and celebration, and other related special occasions. It comes in 2 color variations to make sure it suits your needs and preference. The template comes in the size of 6 x 4 inches with bleed and both vertical and horizontal dimension, 300 dpi resolution, free fonts, print-ready CMYK color mode, optimized PSD files, resizable vector shapes, and easy-to-customize image, color, and text effects. It also includes a user guide in the package for further reference. 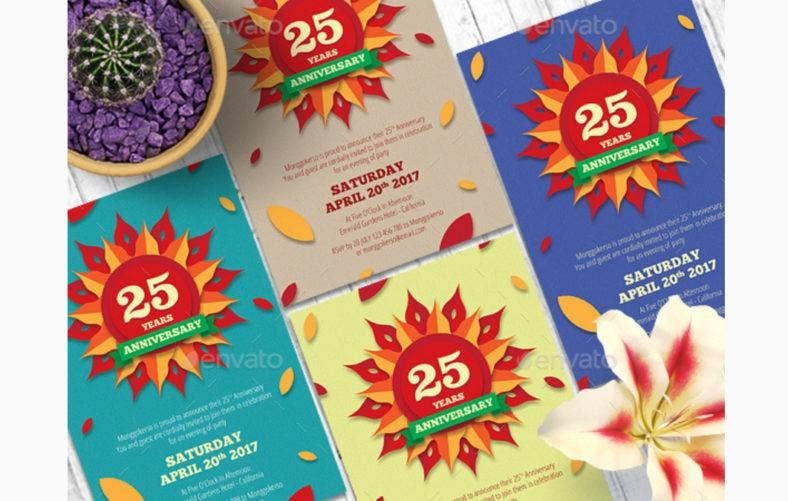 Deviating from the usual elegant and classy themes, this anniversary invitation card template comes in a bunch of bright colors, fun images, and eye-catching typography. It comes in 4 color variations, so you will be able to choose the template that fits your taste and preference. If you’re looking for an exciting invitation card template, this the right one for you. The template’s size is 4 x 4 inches with a bleed area. It uses a CMYK color model and 300 dpi resolution with a well-organized PSD file and changeable images via smart objects. It uses free fonts with easy-to-edit texts and print-ready files. This template can be used for all kinds of anniversary celebrations. This set of elegant flyer pages and luxury art cards is perfect for all types of anniversary celebrations. With ornamental illustrations and stylized gold concepts, these templates are perfect to use as invitation and greeting cards for wedding and corporate anniversaries, especially those used in formal gatherings such as galas or dinners. The set includes vector decorative motifs and elements representing a number of traditional arts from different cultures such as Islam, Arabic, Indian, Ottoman, and more. In the package, it includes 10 EPS files, high-resolution JPG files, Ai CS1 versions, PSD as well as PNG card on a transparent background without text. 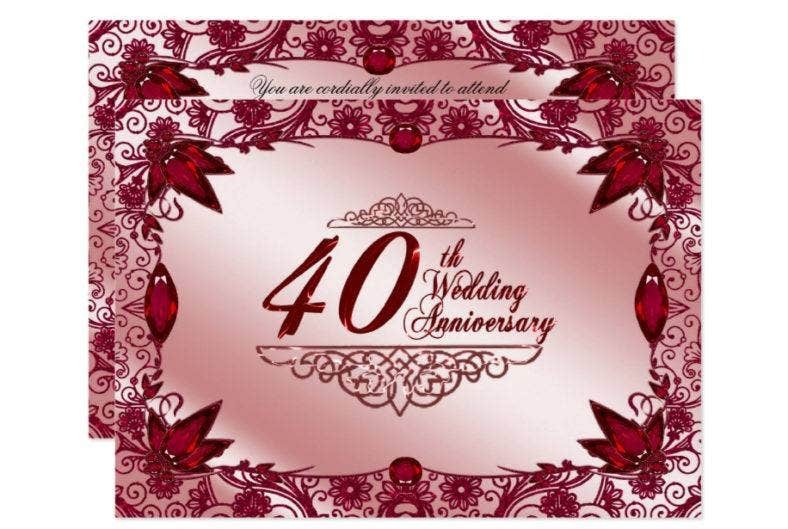 For ruby wedding anniversaries, or in other words, 40th wedding anniversaries; what could be a perfect representation of a long-lasting love than a ruby red-colored card template for your wedding anniversary invitations. 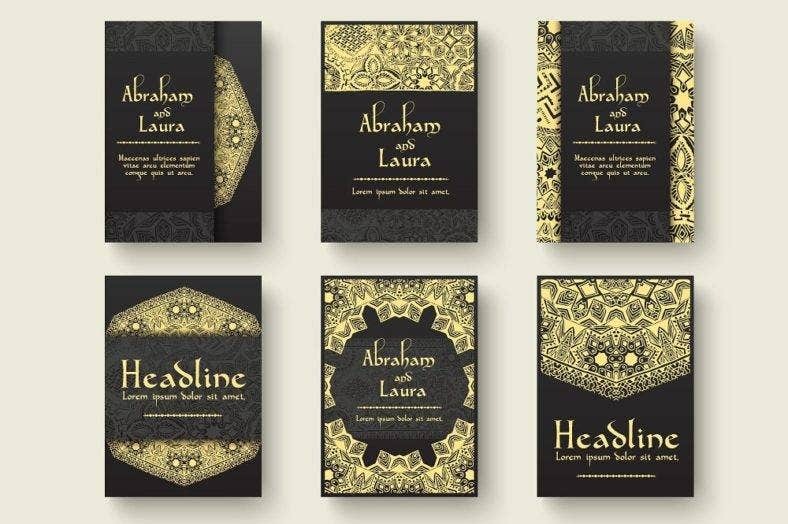 With a variety of custom images, shapes, patterns, styles, and fonts, this template puts them all together to create an elegant and eye-catching design. Available in various card sizes, this gorgeous design comes with a matching design on the reverse with custom text lettering which allows you to change the content to suit your special occasion. It comes with a high-quality, full-color, and full-bleed print-ready file with two printing options available. 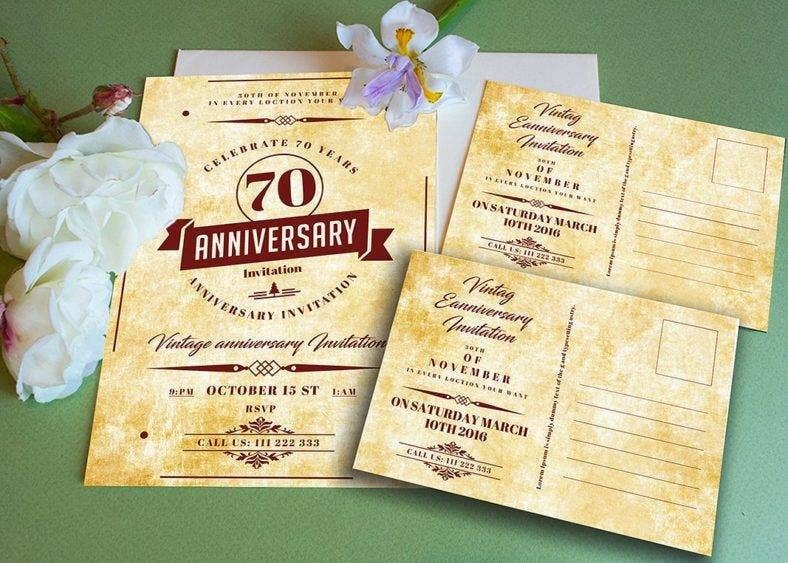 Last but not the least, is this vintage style anniversary collection that is characterized by a set of typographic inscription designs and vector calligraphic anniversary card designs with a retro style. It comes with a number of pre-made and printable card templates for the 10th, 20th, 30th, 40th, 50th, 60th, 100th, and anything in between. Print-ready and easy to customize, the template is resizable and the text is editable without compromising the quality of the design. 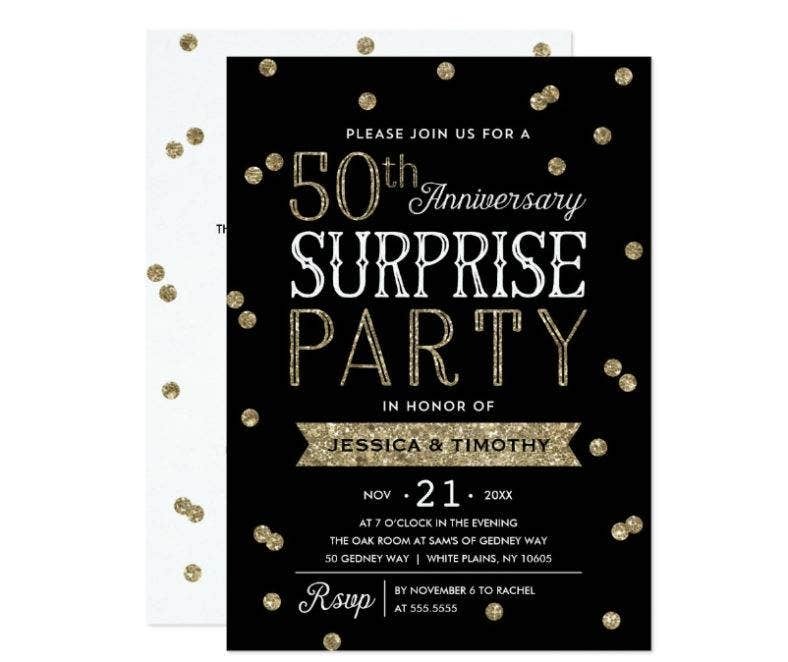 Aside from anniversaries, you can also customize this template and make custom invitations or announcements for every special occasion, like birthdays, weddings, graduations, and many others.